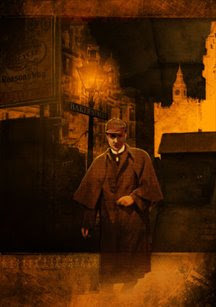 I've already mentioned Gaslight Grimoire: Fantastic Tales of Sherlock Holmes, coming in October 2008 from Edge Science Fiction. It ties in with the theme of this year's World Fantasy Convention in Calgary—'Mystery in Horror and Fantasy'—in that it features eleven new stories involving Sherlock Holmes and the supernatural, the uncanny, and the horrifying. Edited by J. R. Campbell and Charles Prepolec, the book has a splendid cover illustration by Timothy Lantz, and interior illustrations by Phil Cornell. It's the first time that I've seen a story of mine illustrated, and Cornell's piece for 'The Things That Shall Come Upon Them' is excellent. There's even a clue, for the keen-eyed among you who know your supernatural films, as to the identity of the character who drives the plot: look at the portrait hanging on the wall and see if you can work it out.